Lew Voon Khong is currently competing in Mister International 2016 contest representing the multi-culture country, Malaysia. There’s no one better than him to represent the rich diverse country that truly speaks of Asia. To be able to speak five languages, he is apt to be called as Malaysia in an international platform. The smart and suave full time manager for centre for languages, is also creative and talented. In this interview he talks about his passions for languages, pageants and films. While Michele Yeoh is his favourite actress, Neil Perez is his favourite Mister International title holder. Here’s the full interview of Lew Voon Khong with Indian and World Pageant. I am Lew Voon Khong, you may just call me Khong. I was born in Kuala Lumpur, the capital of Malaysia. I love culture, languages, arts and fashion. I am working full time as a manager for a Centre for Languages in a private university in Kuala Lumpur. Aula Cervantes de Kuala Lumpur is one of the department under my centre. We work closely with foreign embassies and institutes in organizing cultural activities such as European Film Festivals, Francophonie Week, Spanish World Book Day, etc. Other than that, I have worked as model for fashion magazines and TV ads. I just love the fact that fashion is a vibrant creature which portrays contemporary culture and arts in human daily life. I have also acted in several theaters, including English, Chinese and French plays. Last year I participated in a filming in Hong Kong. 2. You’ll be meeting citizens from across the world at the Mister International contest. How would you describe Malaysia to them? Malaysia is a beautiful tropical country, with rich cultural heritage and diverse cultures. We have many beautiful beaches in the east coast of Malaya and Sabah, the UNESCO Heritage Cities Penang and Melaka. Everywhere and everyday you will see different kinds of cultural traces, symbols and motifs mixing together wherever you go. 3. You can speak 5 languages and 2 Chinese dialects. Tell us what are they and what really fascinates you about languages? I can speak Mandarin, Cantonese, Hakka, Malay and English since I was a child. have been learning French and Italian in intermediate level for two years, but has stopped for the last six months due to busy working and preparation schedule, and they have become rusty. However I make sure that I read a few articles in French everyday. One of the thing of language which fascinates me is that when one learn different kinds of languages, one will discover that all human communities are actually interacting to each other since ancient time, in many ways, either via migration or trade This connection manifests in language. Interestingly, I’ve found that there are many similar words in Persian and English such as “dar – door”, “setare – star”, “baradar – brother”, madar – mother”. The word for lion is “shir” in Persian and “shi” in Cantonese and Mandarin. Money in Thai is “ngen”, Cantonese is “ngan”. In Korean, to clap hands is called “pakshu”, in which the pronunciation is similar to Hakka. The Malay language, due to Malaya’s strategic location in maritime trade, has imported many words originated from Sanskrit, Tamil, Chinese, Dutch, Portuguese and English. 4. Apart from learning languages, you’re interested in becoming an international actor. Which actor inspire you the most and why? Michelle Yeoh is the most inspiring international actress. Born in small town in Malaysia, Ipoh, she won the Miss Malaysia beauty pageant when she was 20. She represented Malaysia at the Queen of the Pacific 1983 beauty pageant which was held in Australia and won the crown. She was also Malaysia’s representative at the Miss World 1983 pageant in London. Then she entered into the Hong Kong film industry and finally made her name known worldwide in films like Tomorrow Never Dies, and the Chinese-language martial arts film Crouching Tiger, Hidden Dragon, Other than that, she is also a successful entrepreneur. Her dreams, courage and ambitions are definitely something to be looked up to. 5. 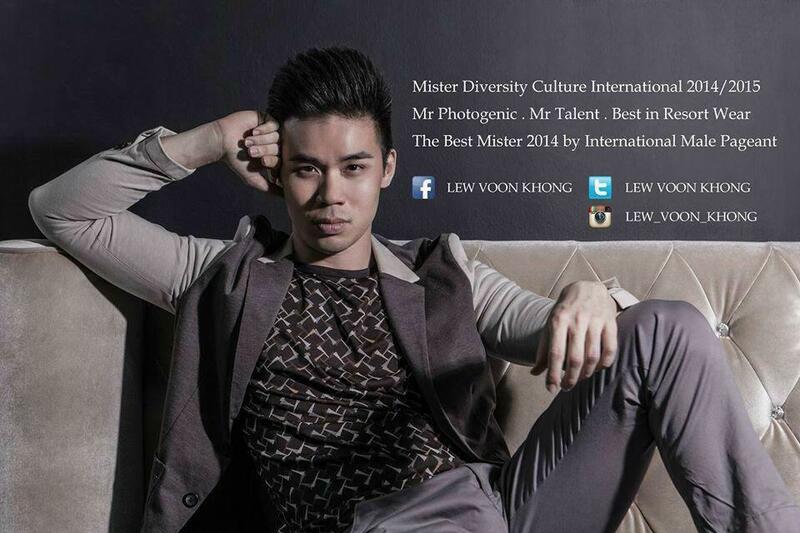 Before being chosen as Mister International Malaysia, you have won Mr Diversity Culture International 2014. Did you know from the start that you wanted to do the pageant? My pageant journey actually started when I was selected as a finalist for a Malaysian-Chinese fashion and lifestyle magazine. I did not win, but it sparked my interest to one day represent Malaysia in an international pageant. and now, here I am representing Malaysia in Mr International finalé! 6. What makes you “Distinctively Handsome”? If someone is to be “distinctively handsome”, he has to have qualities which transcend mere good looks and physical attributes. My curiosity and spirit of learning, my management and organizational skills, my creativity and my sincerity in dealing with others and wanting to do good generally, are the attributes which makes me distinct and bring the brand of Mr International to a higher stage. 7. The contest is getting closer. Do you feel any pressure? 8. Apart from you, who do you think is the strongest to win Mister International title? I still have no idea yet until I see them in real, and in action! May the best wins! 9. What’s the one thing that you look forward to in Mister International competition? 10. Among the previous winners of Mister International, who is your favourite? 11. Lastly, what’s your message to Indian and world pageant readers? Namaste! I love you all and I hope to see you in India one day! Thank you for giving us your time for this interview. I will definitely look forward to seeing you in India. All the very best for the contest. Poll: Who is your favourite Queen of 2016?